The Pan Mass is heart-breaking and heart-warming at the same time. At rest stops, there are large photographs of children who are battling cancer now -- endearing smiles beneath chemotherapy-bald scalps. Many of the cancer survivors who ride the PMC wear buttons, and their vigor is a reminder that cancer is now often cured. Pediatric cancer is one of the success stories of modern medicine -- children who routinely had almost no chance of reaching adulthood are now routinely surviving, and often having their own children as well. For me, the PMC is a very special experience. I feel lucky to be able to ride close to 200 miles (from Sturbridge to Provincetown) over two days, even though I don't do nearly enough training. Of course, there are the septuagenarians who whiz by me at the beginning of each riding day! I like to think it's because they have fancier bikes. This year, there will be over 5000 riders and 9 different routes, and almost as many volunteers making sure that our flats are fixed, the route is well marked and safe, and that we do adequate carbo loading. Cancer is a part of the lives of everyone riding the PMC. I've roomed with men whose children survived retinoblastoma, and I've ridden with men and women who have lost fathers, mothers, brothers and sisters to cancer. I've also ridden with a group of oncology nurses who do fundraising for Dana Farber through both the PMC and the Boston Marathon. (I fell behind quickly.) The ride is two days of smiles and politeness, and celebrating a common cause. Many adult survivors of cancer wear buttons celebrating their triumph, and many family members of cancer victims wear their loved ones names or photos on biking jerseys to remind us never to forget. 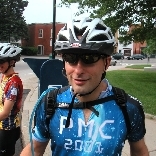 The Pan Mass Challenge is one of the most efficient charity rides around. This year, 100 percent of all donations will be again be sent directly to the Jimmy Fund. The PMC overall goal is to raise $50 million this year to support research. I'll again ride to support the Neuroendocrine Tumor Research Fund (formerly known as Caring for Carcinoid Foundation) The money we raise will be used to fund researchers who are working on a cure for this difficult-to-treat cancer. I hope you'll support me on this ride. You can pledge on-line using a secure server and a credit card. Fill in the gift amount on the right side of this page, or go to www.pmc.org/egifts/jl0070 and click on egifts. My number is jl0070. I'll be live tweeting @pmcjeff again this year.